For the love of vintage glamping accessories, what could make a better bedside table than a young girl’s trunk that loved to travel? In a world of disposable everything, mass production and cardboard replicas, let’s take a moment and revel at something authentic. 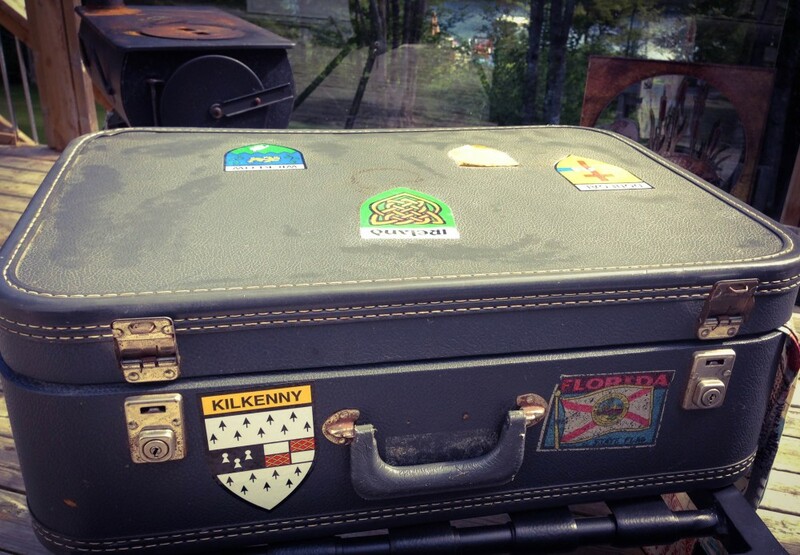 And this vintage suitcase, a new addition to our East Coast Glamping decor has a travelling past worth remembering. 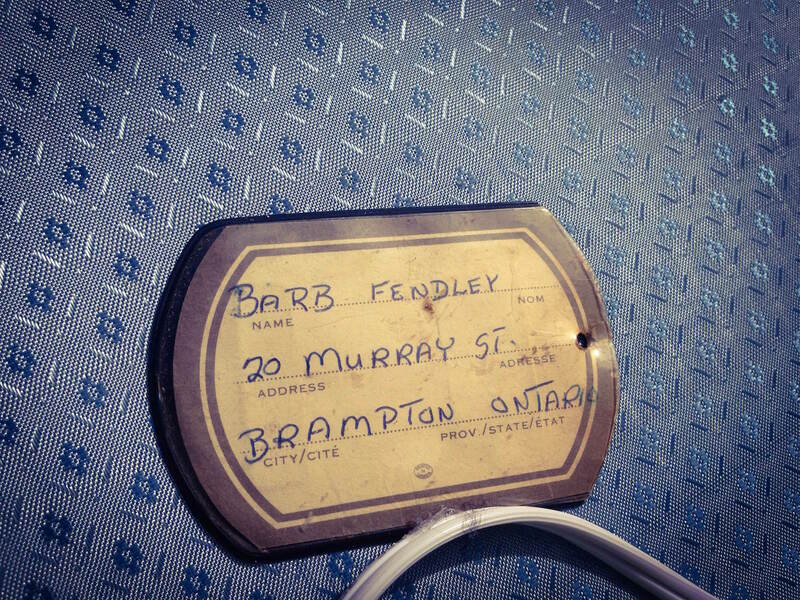 Barbara Fendley was born on Sept. 25, 1949, in what was once known as the small town of Brampton, Ont. It was also the ‘Flower Town of Canada’ and my Auntie Barb was the daughter of a family of several generations of flower growers and sellers. 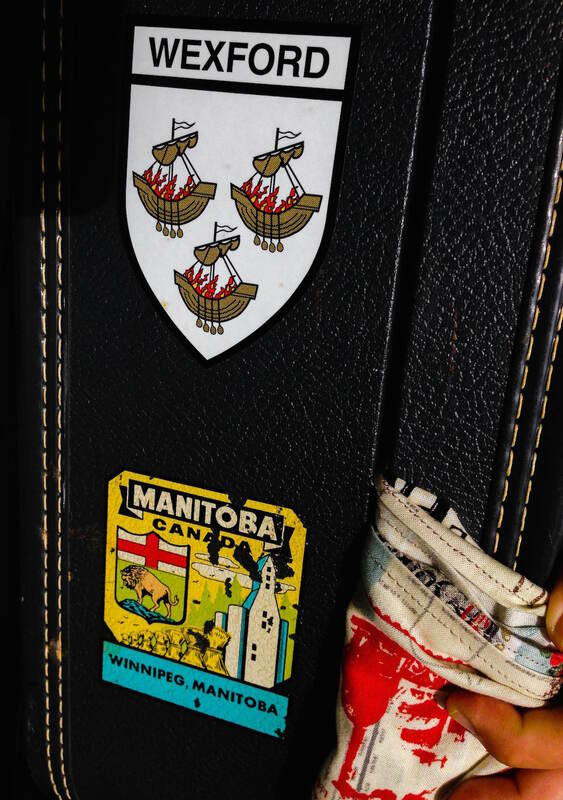 Canadian travel sticker from 1950s & 60s along with a few of our own from Ireland. She grew up in a house attached to the family flower shop and greenhouses, filled with exotic plants like Venus Fly Traps and 2 banana trees long since smuggled back in a golf bag from an ancestors trip to the Bahamas. As a child, Auntie Barb slept in the same bedroom that would one day, in the late 70’s, become my own. My father had taken over the ancestral home and the day-to-day management of the family business, alongside his sister Barb and brother John. I found her old case one day while rummaging around the attic and became fascinated with its worn stickers from far away places and its fancy locks. I love the old travel emblems from Manitoba, Jasper Park and Florida. Places that had inspired daydreams of exotic, foreign lands. This was her travel case that she hauled along on her young adventures. No wheels. No fancy pouches. And so grew my longing for far away places. This little case has lived in Vancouver, a small bachelor pad in Toronto and eventually several homes in and around Dublin, Ireland. It spent 12 years watching us sprout roots, start a family and explore Irish counties and places around Europe. The suitcase became home to footprint pottery, birth announcements and photos of our children. It became a memory box, filled with the beginnings of our girls lives and eventually came to lay quietly, covered in a layer of thick dust under a bed in our Nova Scotia home. The suitcase is all that remains from little attic above 20 Murray St. in Brampton. The 1920s greenhouses are now gone, the shop is no more and Barb passed away before her time in 2006. A silver lining for an old family suitcase. A splash of Parisian vintage & VW fabric mixes with old North American travel stickers. A perfect table for a game of cards, morning coffee, lantern. Happy travels, this little suitcase is back on the road! Today we give her little case a new life, with French vintage-style fabric lining, a fresh wash and will let it set the scene for our guests adventures and travels. Perhaps glampers coming to stay in our bell tents will notice the stickers on their vintage suitcase bedside table. Maybe they’ll add one of their own. Perhaps it’ll make it into a photo or two. Original travel tag written by Barb when she was around 10-years-old. If you look inside, you’ll see the hand writing of young Barb. My Aunt, when she was a young girl and fell in love with exploring, discovery and travel. A wise friend once told me, you have to know where you come from, to fully appreciate where you’re going. Get lost – Find beautiful.